Henri in the Sneaky Grind Café with his Squid Handplane. If you’re driven by the desire to ‘support local’, or you’re just tired of seeing the same surf gear on shelves, in the water, or around town, check out the Surf Collective website. Surf Collective supports the best independent Australian surf brands, a few bigger names but mostly real-deal labels and products you may not be familiar with. There are a lot of interesting labels on there, and this is a set-up with it's heart, and aesthetics, in the right place. Over the past couple of years Surf Collective have also run a program with the Year 10 Business Studies kids at their local High School, Barrenjoey High. The Program is designed to bring the subject to life for the kids by getting them to come up with a surf related product which when they do their learning they can relate it to their product. Surf Collective go in several times during the year to talk to them about real life realities of costing, pricing, brand story etc. At the end of the year Surf Collective put together a "Shark Tank" made up of some local brands and made an evening of it with parents coming along. The kids do their pitch, answer some questions and finally a winner is chosen and receives $1,000 to get their business up and running. This year’s winner is Henri Hole who has come up with Squid Handplanes. A handplane that is made from recycled plywood and priced at $49.95 which will hopefully encourage people to grab one and give it a go! Henri's Squid Handplanes are now on-line at the Surf Collective website and also for sale in their collab with The Sneaky Grind Cafe in Avalon Beach. 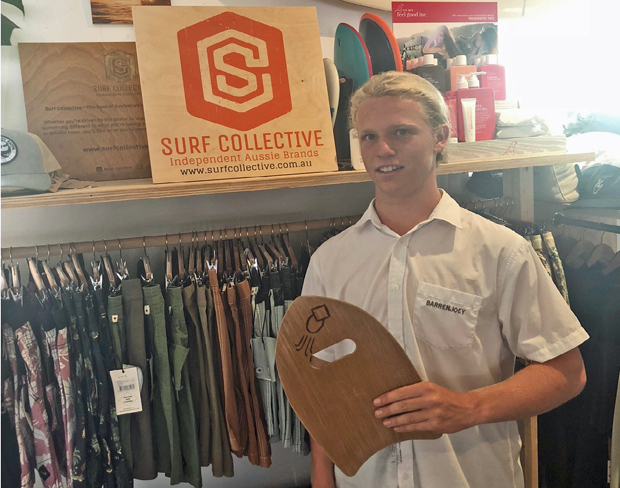 Last year’s winner, Lily McElligott who came up with a Wax Comb made from recycled skateboards has been selling really well and is now also being stocked by McTavish Surf Shop in Byron Bay! How good is that! ?